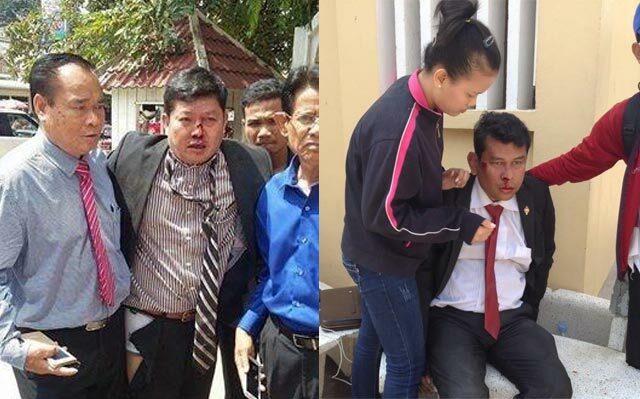 A violent mob organized by the ruling party, beaten up two CNRP's MPs severely injured has stirred up more political confrontation between the two leaders. After condoning violent protest against CNRP's vice president Kem Sokha, Hun Sen also warned that Sam Rainy will face jail term , for he had allowed Hong Sok Hour who was accused and jailed by Hun Sen's court for forging a document about Cambodia-Vietnam border treaty, publishing on his Facebook Page. Sam Rainsy when seeing his party members were beaten up viciously by a violent mob set up by Hun Sen, as a leader of the party, he strongly condemned that brutal attack and demanded the government to bring those perpetrators to justice. Additionally, he compared Hun Sen's tactics of violent intimidation against his party to the fascists in Italy before the World War II in order to delay the two critical elections in 2017-18. Such an analogy even made Hun Sen more furious, and he demanded Sam Rainsy to apologize him publicly or a culture of dialogue between the two parties will be ended. Now Sam Rainsy has faced two more imminent threats from Hun Sen--to face a jail term and to apologize him publicly for comparing him to a fascist. A question is whether Hun Sen's threat to put Rainsy behind bar real? And should Sam Rainsy apologize Hun Sen publicly? Sam Rainsy may face an unpleasant choice. A short answer is Sam Rainsy must deny any wrong doing involved with Hong Sok Hour publishing a so called forgery. And he doesn't need to apologize Hun Sen publicly either. And another question, does Hun Sen allow Rainsy out of hook? It may or may not, but only a political dialogue between the two parties will solve this continuous political confrontation by tuning down their political rhetoric and violent threat. A pattern of violent tactic against political dissidents by Hun Sen's regime has been repeated in Cambodia since the 1993 election sponsored by the UN. This wily, tricky regime has very high skill in dealing with its political opponents by using all available means to humiliate, to weaken, and to destroy them at the end. Usually, Hun Sen plays two actors in the same episode: to be an Asura and Devada at the same scene. Since 1993 election, hundreds of opposition members, union leaders, workers, journalists, environment activists, and even movie and singer stars have been murdered in cold blood and viciously, but none of perpetrators has ever been brought to justice. Such a culture of impunity has flourished in Cambodian society for decades. No one can change or stop it if Hun Sen has magic power to plays two roles as an Asura and Devada at the same time. Sometimes, a victim of violence or discrimination has become a double victims or an innocent person has been framed as a scapegoat to cover up a real murderer. Cambodia has become a hybrid society; it is a constitutional monarchy democracy on the banner, but in reality it is a authoritarian and mafia state. 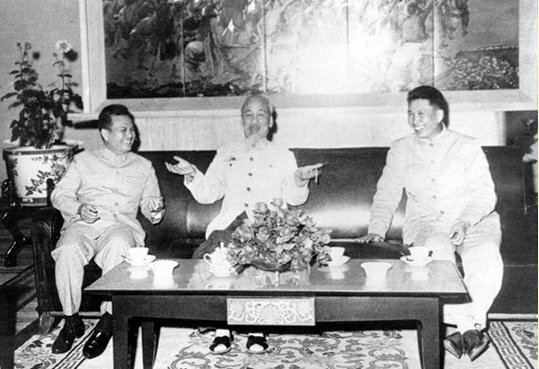 During Pol Pot's regime, they taught people to be obedient and deaf in order to survive, but in the current regime they teach people to see black as white and good people as bad and vie versa. It is very unusual and unreasonable that the prime minister organizes a violent protest against the opposition, a powerless group who has no role to make any key decision relating to the country's affair while the prime minister has all power to decide a fate of the nation. Ridiculously, those protesters demanded Kem Sokha to resign from his post as vice president of the National Assembly, a powerless position, why not asked Hun Sen and Heng Samrin to resign, who have held power over three decades and committed countless mistakes and atrocities? In democratic countries in the world, the people protest and criticize their leaders or the ruling party, for they run the country so they eventually makes some mistakes. And the people demand them to resign when they commit severe mistake or fail to fulfill their promises, not to ask the opposition leaders to resign; they can't hold accountable for the people since they don't rule the country. Such a violent mob against the opposition party rarely happens in democratic countries, only in authoritarian states. But this violent mob here can be easily to prevent it if Hun Sen did not give a green light and the authority has been given order to stop it. A violent set up protest against Mr. Kem Sokha, a vice president of the National Assembly and vice president of CNRP took every one by surprise since this violent protest was quietly organized by the CPP's network, and they intended to harm the CNRP's MPs physically and emotionally. 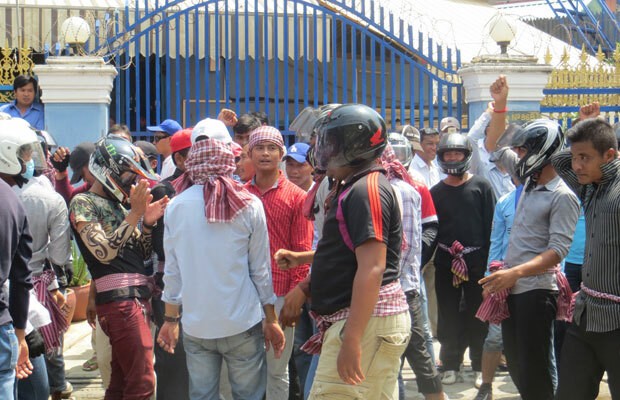 This violent mob usually incited and organized by Hun Sen who used to play such a shameful and violent game against his opponents numerous times in the past. This is not a new story, as Dr. Kem Ley said, " when I read this story, I already know who is an author." Exactly, all the sagas of such violent protests always organized and stoked by the powerful person who is siting above the law. A clear evidence that confirmed Hun Sen had stayed behind this violent demonstration is a Hun Sen's statement from Paris, warning the opposition party, " if you get mad, don't play and if you play, don't get mad. And playing at this time you can lose the vice president post of the National Assembly too." Magically, less than 24 hours after Hun Sen's statement, a large group of violent-prone mob dominated by men, and some of them wore black caps to hide their clear identity stormed in front of the National Assembly and the other big group besieged Kem Sokha's residence, demanding him to step down from his position. And some of them pretended to be CNRP's supporters accusing Kem Sokha of making empty promise during his 2013 election campaign. The other evidence that indicated this violent protest was set up by Hun Sen and his CPP's supporters is the situation around the National Assembly Building is so unusual because there were big group of loud protesters, but there were no police and security forces presence to protect the National Assembly as well as to stop or disrupt the protesters as they used to do in the past according to a CNRP's spokesman, Mr. Yem Sovann, Human rights observers, and the Journalists' accounts. All these proofs have clearly pointed out that This violent mob that caused severe injury two CNRP's MPs was orchestrated and set up by Hun Sen and his security agents. Hun Sen is more likely to order this violent protest to counter peaceful protest by Khmer overseas in France during his three day state visit in Paris. Because Hun Sen baseless accused the opposition stayed behind those protesters against him in Paris when the CNRP has strongly denied its involvement. Is Hun Sen's threat of war real if he loses an election? In the past few months Cambodian political atmosphere has turned into a boiling point since Hun Sen has reneged all his political agreements with CNRP on July 22, 2014 by employing his old tactic of intimidation and imprisonment CNRP's political activists including a senior CNRP's official Senator Hong Sok Hour, a border expert for the party. 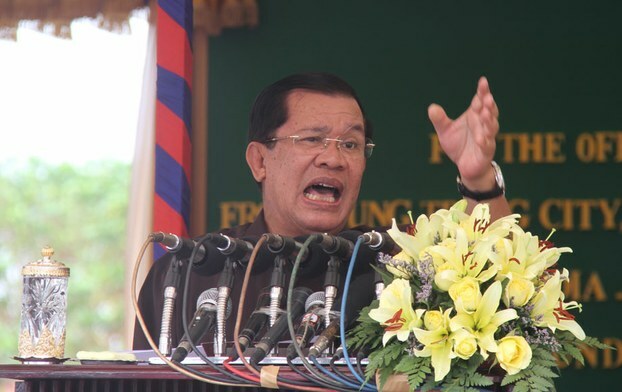 Along with imprisonment, Hun Sen frequently repeats his threat of war if he or his party lose the incoming general election in 2018 by inciting or encouraging his military, police commanders and his appointed provincial and district governors to turn against the winning party if those officials will be replaced with new members from the wining party. Furthermore, Hun Sen recently has promoted his second son, Hun Manith, to be a chief of an intelligence department similar to the job of the US's CIA director while his oldest son, Hun Maneth, has maintained a position as a deputy commander of his father's bodyguard unit, an elite troop designed to protect Hun Sen and his family is similar to the US's secrete service which is assigned to protect the President and his family. Many analysts and political observers have concluded that Hun Sen has tried all his ability to cement his long time power grip by promoting his children and his relatives to the key security positions in order to clarify his doubt and fear of losing power. The more Hun Sen fears, the more he makes threat to all his opponents and all the people. Will the war really happen if he loses election? The answer is may or may not happen, but if it happens, it will be a short one, not a protracted war as in the 1970s and 1980s. As a new election is about two years away to happen, Hun Sen has deployed his old trick, threatening his opponents as well as the whole nation that war will be imminently happened if his ruling party loses election. This verbal threat should not be looked over since Cambodia had experienced the most bloody war and genocide in the 1970s and fallowed by invasion war in the 1980s, many people have a good reason to fear about it. Most Cambodian people had lost their loved ones during past wars and genocide, and no one wants to see such a horrible event happening again in any circumstance. However, the fear of war has been fully exploited by Hun Sen in recent election campaign in 2013, and now he starts to renew his threat of war again. Although the economy has grown in a remarkable way under Hun Sen's rule, human rights, democracy, and a rule of law in the country seem move in opposite direction from the economy growth. Hun Sen never let democracy flourish as the economy; he may try to swim against the water current or try to prove that political theory is wrong. The Kingdom’s judiciary took a lashing last month when the International Bar Association published a report that found Cambodia’s courts to be plagued by corruption, bribery and political influence. The report, titled Justice versus Corruption: Challenges to the Independence of the Judiciary in Cambodia, painted a grim picture of the Kingdom’s judicial functioning and cited a lack of confidence in its operations from both locals and foreigners. Endemic corruption across every sector, including the judiciary, is one of the reasons for Cambodia’s abysmally low “Ease of Doing Business” ranking put out by the World Bank. The annual rankings placed Cambodia 184 out of 189 countries for ease of doing business, with enforcement of legal contracts ranked 178th – reflecting the state of the Kingdom’s court system. The impact on investment is likely significant. Having a “strong and effective” judicial system was one of the key factors incoming investors would base their investment decisions on, said Matthew Rendall, senior partner at Sok Siphana and Associates. “It is not in and of itself necessarily a factor which may cause them to choose not to invest, but it certainly forms part of their considerations when deciding whether or not to invest,” Rendall said. Um Sam An visits Cambodian-Vietnam border. After combing through the United Nations’ archives in New York, firebrand Cambodia National Rescue Party lawmaker Um Sam An challenged the UN’s claim that they do not have a copy of Cambodia’s official border maps. In a Facebook post, Mr. Sam An shows himself holding a copy of a map that he says is the one recognized in the Cambodian constitution. 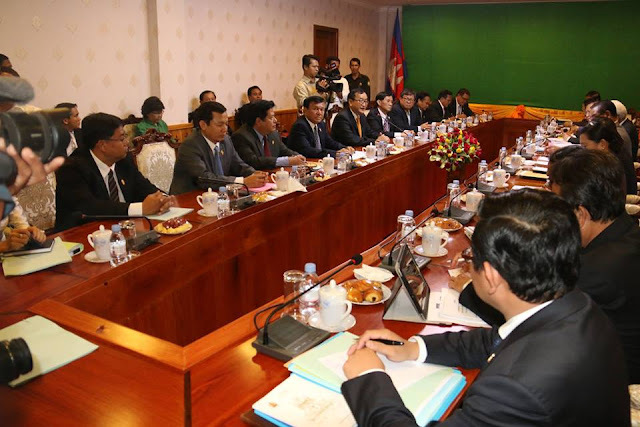 Following relentless pressure from the CNRP, and accusations that the government had knowingly conceded land to Vietnam, Prime Minister Hun Sen requested a copy of the maps – which were drawn up by France’s Indochina Geographic Service – from the UN in July. In response, the UN sent 18 maps from 1964, recognizing they were not the same that the prime minister had asked for. Now, Mr. Sam An is challenging the UN’s claim that they did not have the official border map. “I ask the government to request these maps from the UN to compare them to the government maps, which they are using for border demarcation. They should then use the UN maps only and stop using the Cambodia maps, which have a Vietnamese stamp,” he wrote. “The government didn’t have this map from the UN while they demarcated 83 percent of the border. So, they must review the prior demarcation,” he added. Rallies in Sydney and Melbourne call for closure of Pacific island detention centres for Australia's asylum-seekers. Thousands of Australians joined rallies calling for the closure of Pacific island camps for asylum-seekers, just days after the government confirmed it was in talks with the Philippines to resettle detained refugees. Under Canberra's tough immigration policy, asylum-seekers attempting to reach the island continent by boat are turned back or sent to camps on Nauru or Papua New Guinea and barred from resettling in Australia even if found to be refugees. The detention centres are not suitable environments for the health of all detainees, but the effects on children are far worse. Chanting "free, free the refugees", the protesters on Sunday in Sydney, Melbourne and other cities said the government and Australian Prime Minister Malcolm Turnbull should close the Pacific detention centres, which have been harshly criticised by rights groups. 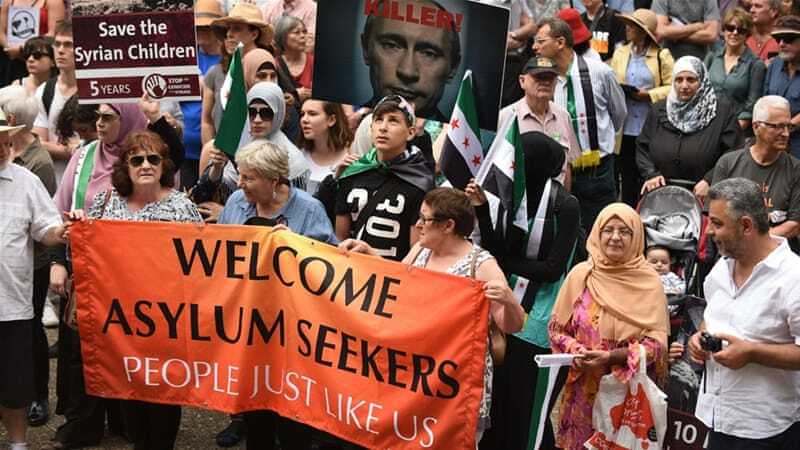 With Australia set to resettle 12,000 Syrian refugees amid the crisis in Europe, some demonstrators waved Syrian and Kurdish flags and said the government should move those held in the camps to the mainland. New documentary raises a question: Do Cambodians overseas owe a duty to their homeland? In the trailer for the documentary The Roots Remain, the subject of the film, Canadian-Khmer graffiti artist Fonki Yav, delivers a call to action to the Cambodian diaspora. The film, which will be screened at the Cambodian International Film Festival in December, focuses on Fonki’s return to the Kingdom, where he meets with members of his extended family and explores Cambodia’s burgeoning hip-hop community. Co-director Andrew Marchand-Boddy said that along with documenting Fonki’s experience, he hoped the film might encourage overseas Cambodians to follow his lead. “[W]e hope that our film will inspire more Cambodians to return and try to make a difference in people’s lives as well,” he said by email. But to what extent, if any, do overseas Cambodians – many who left the Kingdom as young children during the tumultuous periods immediately before and after the Khmer Rouge – have a duty to return and lend a hand in Cambodia’s renewal? Virak, who is now 39, received most of his education in California. Geoffrey Howe was one of the longest-serving Conservative cabinet members of modern times. He was at the Foreign Office for the second longest period of the 20th Century, and was a reforming and innovative chancellor. Possessed of an owlish gaze and courteous manner, he was seen as an effective, if somewhat plodding member of the Thatcher administration. It was therefore, something of an irony, that it was his measured tones that precipitated the downfall of one of the highest-profile prime ministers in British history. Richard Edward Geoffrey Howe was born in Port Talbot, South Wales on 20 December 1926. His father was a solicitor who was also the local coroner. It was an area which had been dominated by Labour since Ramsay MacDonald won the parliamentary seat. His grandfather had been a staunch trade unionist and Howe later recalled the long queues at local employment exchanges while he was growing up. He remained a proud Welshman and later regretted not having learned to speak the language. He left Winchester College in 1944 and joined the Army, serving as a signals officer in Kenya where he learned Swahili and lectured the locals on the perils of communism. He turned down the opportunity to remain in the Army, instead going to Cambridge where he read law and dabbled in Conservative politics. "Not because of strong political commitment," he later recalled, "but because of an interest in taking part in politics." He became a founding member of the Bow Group, an independent think tank that promotes Conservative ideas. He was called to the Bar in 1952 but politics still beckoned. He contested his home seat of Aberavon in 1955 and 1959, in both cases failing to unseat the Labour incumbent. The following year he married Elspeth Shand who later carved out her own successful career in public life. 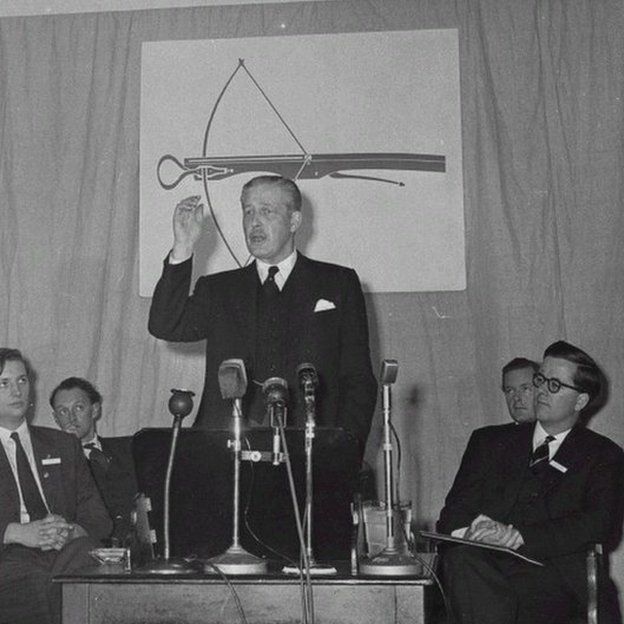 In 1958, he co-authored a report, entitled A Giant's Strength, which argued that the trade unions were far too influential and that their power should be curtailed. It was useful research for the battles with the unions that would ensue after Margaret Thatcher's election. The principle of non-refoulement is a cornerstone of refugee and human rights law. Underrefugee law, it bars the return of anyone in any manner whatsoever to a place where theywould be at real risk of persecution or other serious human rights violations. Underinternational human rights law, it bars the transfer of persons to places where they wouldbe at risk of serious human rights violations, irrespective of the reasons for such violations. seeking asylum in the county. various minority groups in Viet Nam’s Central Highlands – seeking asylum in Cambodia. refused to register the asylum claims of at least 100 more. provided for by Article 14 of the Universal Declaration of Human Rights. School of Vice: Clear as tropical daylight that neither Pol Pot nor "Cambodian racism" is behind the plight of the Montagnard refugees. Not unless a spin is placed on the issue by someone with a skewed mind and logic. Public democratic sensitivity and reaction concerning human rights matters in the world at large can play its due [positive] part here at a critical time of heightened regional tension, ... as it had decisively done to bring the "Vietnam war" to conclusion - in many's opinion. The planned upcoming deportation of Montagnard asylum seekers back to Vietnam will include 13 already recognised as refugees in March unless the office of the UN High Commissioner for Refugees (UNHCR) can find a third country to resettle them, the UNHCR and a refugee advocate said yesterday. Denise Coghlan, director of the Jesuit Refugee Service in Cambodia, said along with a three-month deadline set in September for more than 200 Montagnards in Phnom Penh – who have been denied a chance to register as asylum seekers – plans were afoot to kick out those already officially declared refugees, saying their expulsion could be “imminent”. UNHCR spokeswoman Vivian Tan said the agency, which is currently assisting in repatriating Montagnard volunteers, had also heard a deadline for the refugees had been set. 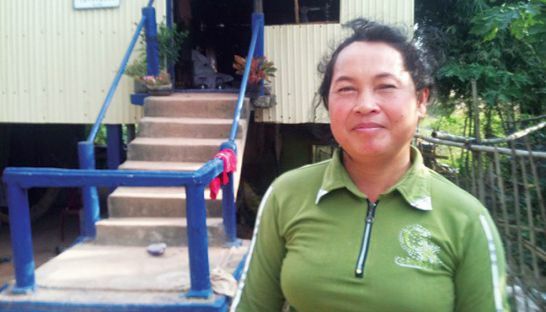 She said the agency had “communicated our position to the Cambodian authorities” but did not elaborate further. 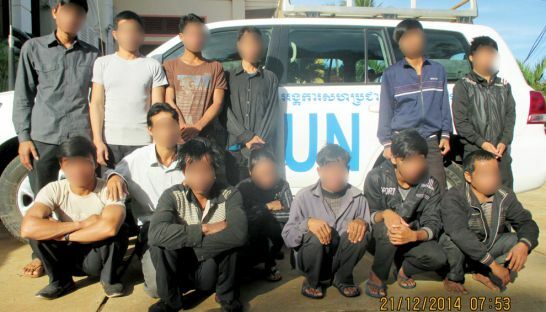 In February, Interior Ministry spokesman Khieu Sopheak said the group – recognised as refugees in March after the UNHCR escorted them to the capital – would be deported regardless of their status if no third country would take them. Yesterday, he would not address questions about when or why they would be deported, a move that would violate the UN Convention on Refugees, to which the Kingdom is a signatory. A new museum dedicated to celebrating Cambodia’s peace builders is in the plans for the Siem Reap-based Centre for Peace and Conflict Studies. The organisation’s founder and executive director, Emma Leslie, flew out to the US yesterday to kick off the fundraising drive, together with Soth Plai Ngarm, her husband and peace activist, who is a founding member of the Cambodia-based NGO Alliance for Conflict Transformation. 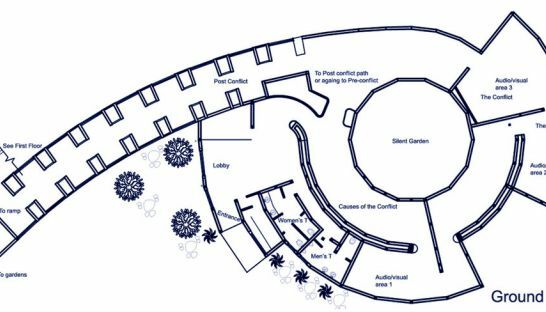 The idea for the museum, which will be called the Cambodia Peace Musuem, came to him during a conference in 2008, and they have been working on its details bit by bit ever since. “We want to give a more positive perspective for the future,” said Ngarm. “There are many institutions that focus on Cambodia’s and Asia’s wars, but our point is not to compare to other museums but to focus on the positive side of history,” he said. Using interactive exhibits, personal stories, documentary, graphic art, sculpture and more to highlight the resilience of Cambodia’s people in transforming conflict and overcoming adversity, Ngarm talked about a virtuous circle in which, by focusing on the more positive elements of Cambodia’s history, the healing process for the country and its future can be stabilised and start to feed itself as people’s confidence grows. Rokar village empties during the dry season as the workforce migrates to find more gainful employment. But when the monsoon arrives, they return, not to fish as has traditionally been their staple income, but for a more lucrative trade: catching leeches. Chinese demand for the bloodsucking worms, which are used widely in traditional medicine, can earn the Rokar villagers up to 10 times what they would make from fishing, villagers told the Post. Khorn Kosal, a 40-year-old leech catcher, carries a bucket covered in cloth as he walks towards the house of a local businessman in Kampong Thom province’s Stung Sen district who is a regular buyer who supplies to the Chinese. He says the trade had become popular in recent years as fish stocks have dwindled in the area. “During the rainy season, people return to the village because they can earn money easily from catching leeches. It’s much easier to earn money catching leeches than it is from fishing,” he said. Kosal places the bucket on the ground and removes the cloth, revealing scores of squirming leeches inside. Sometimes, the leech catchers venture as far as Poipet, Battambang and Kampong Chhnang in search of their prize. “We find out where the leeches are by asking rice farmers. When we know the place where the leeches are, we rush to catch them,” Kosal adds. 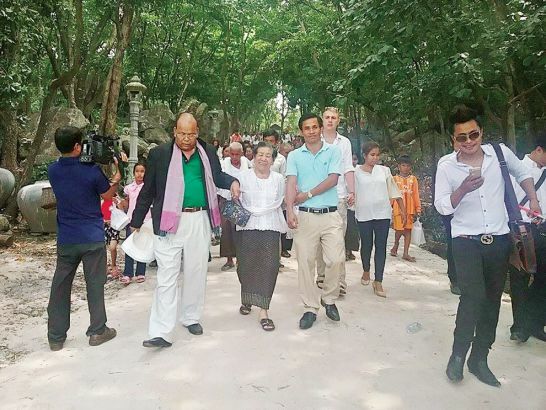 The ruling Cambodian People’s Party has denied involvement in blocking opposition leader Sam Rainsy from visiting a pagoda in Oddar Meanchey province on Wednesday. CPP spokesman Sous Yara sent a letter to the Post saying that the opposition Cambodia National Rescue Party has only itself to blame for its public relations problem. “So please, CNRP, find a solution to your local internal power [struggle] by yourselves and respond to the people’s concerns [about your party],” said Yara. Ken Kosal, a former CNRP councillor who defected to the CPP in June, blocked Rainsy from entering a pagoda in Samroang town with a crowd of 350 people and 27 homemade tractors. He has previously said that no one ordered him to hold the rally and that he did it because Sam Rainsy failed to follow through on his promise to help the people of Oddar Meanchey. 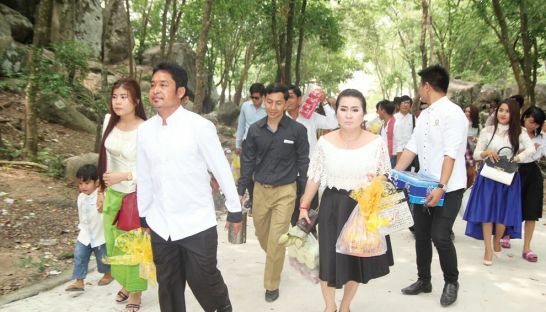 CNRP spokesman Yim Sovann, along with Bun Kim Heng, the opposition party’s councillor of Oddar Meanchey, said yesterday that Chhim Toeu, the director of the provincial culture and religion department in the province, was involved in the effort to block Rainsy. The blockers were “not ordinary people,” Sovann said. Toeu declined to comment yesterday. Responding to shots taken at Cambodia’s education system by opposition leader Sam Rainsy, the Minister of Education yesterday questioned the long-term expat’s Khmer literacy. In the video, Rainsy promised to make educational reform a high priority if elected and slammed the value of degrees awarded in the Kingdom. “Cambodian degrees are given left and right, what use are they if they have no quality? To stick on a wall?” he asked rhetorically, characterising the education system as “very weak”. Speaking at an event at the Cambodia Institute of Technology yesterday, Minister of Education Hang Chuon Naron responded to the remarks, citing improvement over the past 15 years of relative stability, then launched a personal attack on Rainsy, who has spent much of his life in France. “The attack is vain; he is a politician that only speaks but never acts,” he said, adding that Rainsy’s foreign education means he does not value the Kingdom’s. 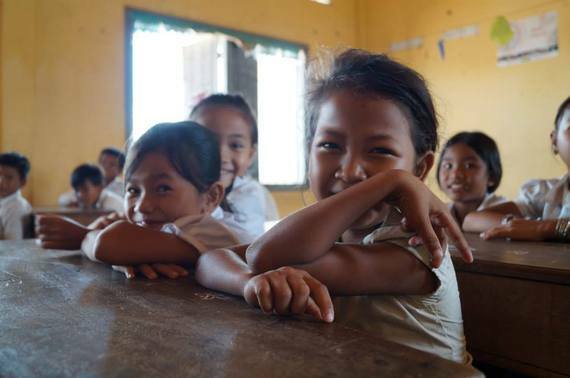 “We are not sure that he knows how to write Khmer very well,” Naron continued before promising renewed attention to teacher training and better salaries in 2016. San Chey, coordinator of ANSEA-EAP – a social accountability NGO – said Rainsy’s criticism applies to higher education, which has seen “no change”, but was unfair given high school exam and curricula reforms. Chey suggested that if Rainsy has a reform policy in mind, then “why not work together with the Ministry of Education and do it”. 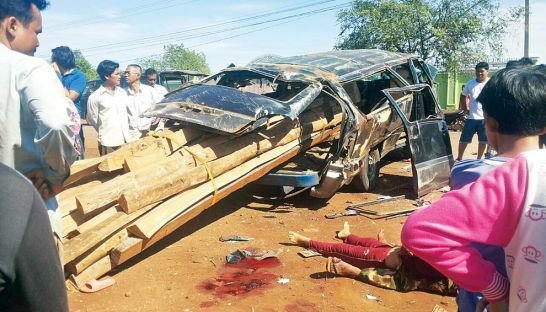 School of Vice: This "Killing Fields" chapter on the roads of Cambodia certainly lasts longer than the one in 1970s. Netflix, the world’s biggest internet television network, is set to change the local pay-TV landscape when it launches services in Cambodia next year as part of a global rollout. “We intend to offer our service globally by the end of 2016 and that includes Cambodia,” Netflix spokesman Jonathan Friedland told the Post in an email. Netflix has 65 million subscribers in over 50 countries and has borrowed $1 billion to finance a global presence. The US-based streaming video on demand (SVOD) giant already has a foothold in Asia, having entered the Japanese market last month, and plans to move into Hong Kong, Taiwan, Singapore and South Korea early next year. It plans to complete its 200-country campaign by the end of 2016. The company, which also puts out original programming such as House of Cards and Orange Is the New Black, says growing internet use and interconnectivity in Asian markets have broadened opportunities for streaming video. “The combination of increasing Internet speeds and ubiquity of connected devices provides consumers with the anytime, anywhere ability to enjoy their favorite TV shows and movies on the Netflix service,” Reed Hastings, CEO of Netflix, said in a statement. While Cambodia marginally stepped up efforts to combat child labour in 2014, a lack of resources and corruption remain massive impediments to the fight, according to a report released by the United States Department of Labor last week. The report rated Cambodia as having made “moderate advancement” in its anti-child labour efforts, the same ranking it received in 2013. It attributed those improvements largely to beefed-up inspections from the Ministry of Labour, which increased the number of inspectors trained to find child labour from 35 in 2013 to 58 in 2014. However, the report states that significant shortfalls remained. For example, as of 2014, child labour inspections were only being conducted in the capital region. “The Department of Child Labor reports that, due to budget constraints, it is able to conduct inspections only in and around the capital city of Phnom Penh,” the report stated, citing the US Embassy. However, Veang Heang, head of the Department of Child Labor, yesterday denied that account. “We do have provincial departments of labour who are in charge of child labour in the provinces,” he said, adding that commenting further would require permission from the ministry.